Hyundai has officially announced that the new N performance brand has whipped the current Veloster into sporting shape, and it’s ready to go toe-to-toe in a title fight with Volkswagen’s 7th generation GTI. While the 2019 Hyundai Veloster N starts about $500 higher than the VW, at $26,900, the N offers an extra 30 horses—at 250 versus the GTI’s 220—in the stable. Things get really interesting when you check the box for the N Performance Package, which nets you 275 horsepower, an electronically controlled limited slip, a performance exhaust, bigger brakes, and bigger wheels for $2100 extra. Unlike the GTI, however, the Veloster N is only available with a manual gearbox, which is great in my eyes, but will likely hamper sales in direct comparison with the German. 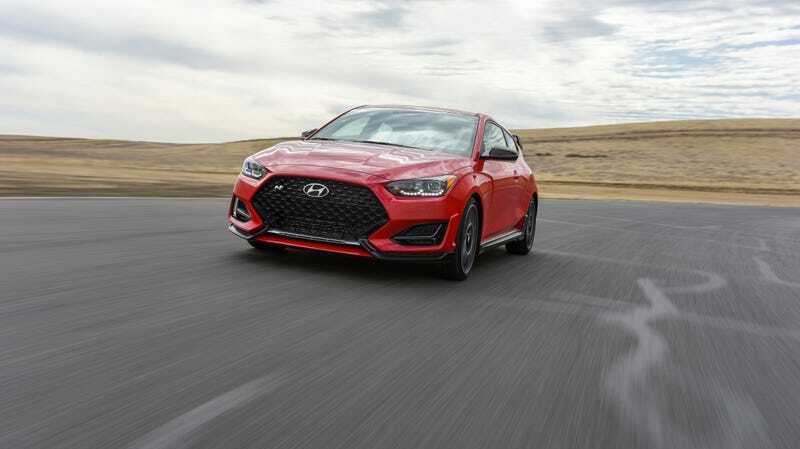 With the extra power, one could argue that the Veloster N is actually punching above its weight class, aiming for larger targets like the Civic Type R and VW’s Golf R. It’s certainly priced smarter than either of those options, but doesn’t have quite the visual gravitas of the CTR or the all-wheel drive composure of the R. Call it the Goldilocks just-right of the hot hatch segment, perhaps. I’m really quite smitten with the car shown in photos here, and unlike many things in the market today, its sub-30 price point seems like an actual decent price for the level of performance provided. The red accents and serious aerodynamics look purposeful, but not Civic Type R-obnoxious. Hyundai promises that the N team has focused on the driver’s BPM instead of the engine’s RPM (whatever the hell that means), presumably in an effort to focus on driver enjoyment. Considering the head of the N division, Albert Biermann, came over from running BMW’s M, they might be on to something. Let’s hope the Veloster N is a little more E46 M3 or E39 M5 than G15-series Big M8.